Oh, who am I kidding? As if we only eat things based on the holiday or occasion. Especially when it comes to awesome snacks or desserts that contain veggies but still taste like desserts! I think you all know what I’m talking about (besides the fact that you already saw the title of this post). Carrot cupcakes! 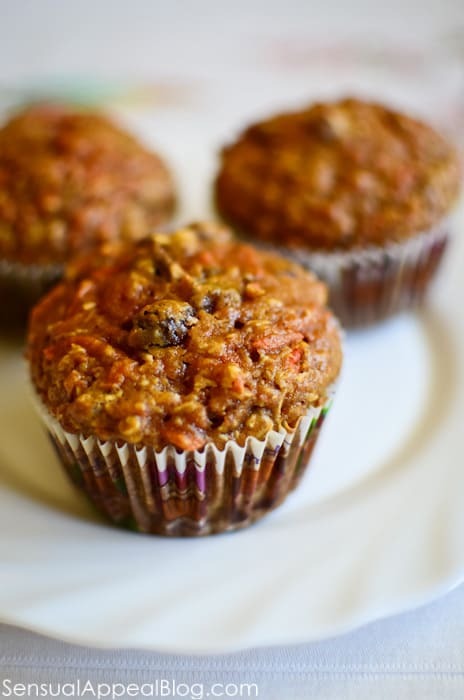 Well, okay… carrot muffins in this particular sense. The truth is, these muffins are actually a cupcake base. I meant to make a different variation of my carrot cupcakes with lemon cream cheese frosting that I made for last year’s Easter. However, we didn’t have any cream cheese at the time. And when we actually bought the cream cheese a week later, I no longer felt like making cupcakes. Was I lazy? Was I just not feeling it? I don’t know, but either way – I felt like making these cupcakes… I mean muffins, plain, without any topping. And guess what? STILL amazing and delicious! I adapted the recipe from my original carrot cupcakes but with some changes. I made these at my parents house a few weeks ago and my mom didn’t have any whole wheat flour. That’s the reason why my recipes lately were all using Ultragrain all purpose flour. No worries, though, I made sure we bought some whole wheat flour on our next grocery trip before I went back to my apartment. Clearly, these include coconut while the originals didn’t. 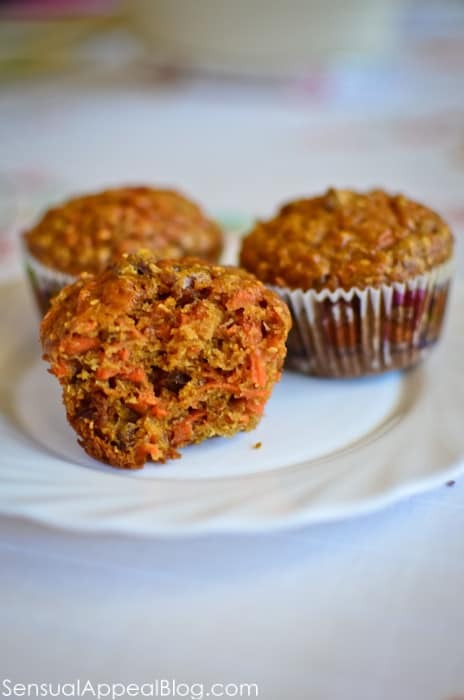 I think these muffins came out great, they were moist, the sweetness factor was just right and I liked the fun complexity that coconut added to these carrot muffins. Enjoy! What’s your favorite Easter snack/dessert? Do you eat it only around Easter time or do you eat it whenever? What is your favorite flour to use for baking? Ooh these sound delicious and easy for a non-pro to do, thanks!! Im jewish coconut loving misfit who makes MACAROONS for passover! They look so so good. These look amazing!! 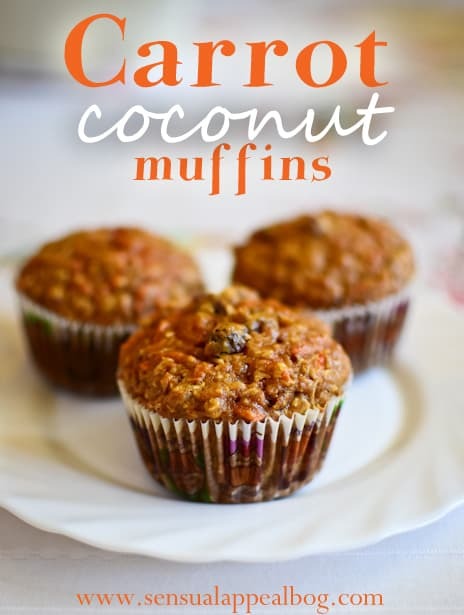 I was just looking for a carrot muffin recipe this weekend. Can’t wait to try them. Yay! Well I’m glad this was a timely recipe then! Hope you do try them, let me know how you like them! It’s never to late to post about carrot cake! This would be super simple for me to make vegan. My husband will love it! Yay! 🙂 I’d love to hear your feedback once you make it your own! Hmm, can I say deviled eggs? I’m not usually much of a dessert fan (though I love carrot cake…it’s just usually too sweet for me) but I ALWAYS look forward to the plate of little egg halves! Actually, pretty much every holiday or family get-together we have deviled eggs because everyone loves them so much!